Authors, Kay Williams (left) and Jerri Williams Lawrence, are available to participate in book discussions by phone or, in some cases, in person. Jerri can participate in person in the Franklin County (Ohio) area; Kay Williams, in the NYC area. Please contact the publisher to set up time and date for authors’ participation. Photo by Tom Dodge/Columbus Dispatch. Here in an aging America - unlike so many other cultures - we have a love affair with youth. Our television commercials, magazine ads, and even most television shows are geared to the younger, beautiful people. Instead of being overlooked, how could the contributions of our older generations be acknowledged and used to benefit society? In the novel, Dixie is 79 and Morgan is 89. How realistic is it to expect to fall in love at that age? Discuss the complications of romance and marriage at this stage in life. Also talk about the advantages. Dixie would possibly like a relationship but does not want to turn into a care giver. Do you think she is selfish? Would you take the kind of risk she takes by inviting Morgan into her life? Discuss your thoughts about whether women manage being alone better than men do. Although the novel explores problems related to aging, it also explores relationships, motivations and needs of human beings at every age. How does your view of Tony change as the novel progresses? Dixie has concerns regarding Morgan's past. Is she right to be worried? Grandson Tony has been led to believe that Morgan is wealthy. Had Morgan been treated fairly by his family? Did he create some of his own problems? Dixie is afraid Morgan will be repulsed by her body and Morgan is afraid he might not be able to perform. Discuss the nature - and truth - in these fears. Do we all have young minds in aging bodies? Discuss your thoughts on sexuality as life progresses into the later years. "Thank you both so much for giving our book club such a wonderful evening! It was such a joy to hear you share your stories and those of your dad. You gave us such insight into the writing process that we were all awed and inspired." There are many new challenges that surface as we age. In the story, Dixie struggles to keep her house up and is considering taking in a boarder. For retirees, finances can be a huge issue even with the best of planning. The thought of not being able to drive and losing independence is painful. The decision to consider a move to a retirement home means giving up privacy and independence for the rest of life. The novel also touches on end-of-life choices. How do we prepare to face these difficult decisions? Discuss others you know who have helped determine what you'd do - and what you wouldn't do. What does the novel suggest about the importance of stability in family life? How has lack of it affected Dixie? Morgan? Tony? How important are the following people to Tony and how do they influence his outlook and attitude? his father, his stepfather, Eddie, Officer Pfeiffer, Dixie, Morgan, Laura. How important is Tony to Dixie? to Morgan? As the novel progresses, the reader sees change and growth occurring in Morgan, Dixie and Tony. What events seem to most influence growth and change in Morgan? Dixie? Tony? "Thank you for the phone chat. You got our book club off to a great start this year. We all enjoyed talking with you and we loved One Last Dance." 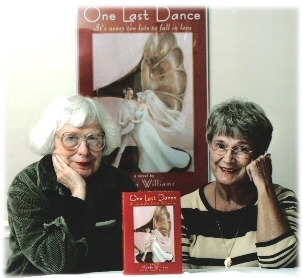 "My book club enjoyed reading One Last Dance! We all agreed that it made us think about our future more. We all thought, "What will happen to us when we get old?" Also, we all loved that no matter how old you are, there is a chance for romance. A couple of the members are going to have their single moms read the book for inspiration." After the accident, Morgan's recovery is slow - in part due to his age. Dixie ends up being the care giver after all and cannot go to her job even though she has bills to pay and needs the money. Morgan ends up in Whispering Pines Nursing Home and Dixie must face the cold hard facts of Medicare and Medicaid and the sad cost of being old and sick in America. Are there solutions to these problems? Do you have hope that they'll be implemented for your benefit? Morgan thinks to himself, "Who would ever believe the best thing that ever happened to me happened at age 90!" Do you think the same is possible in your own life? The author, Mardo Williams, wrote his first novel at age 92. He suggests we live life every minute and always be in search of new experiences regardless of age. Discuss the title of the book and how it fits the story. How did the novel influence your thoughts and expectations for the future?